Ever since the Absinthe jailbreak for the A5 chip (Click here to read more about them) combined with my new purchase of the iPad 2 which has the A5 chip as it’s processor, I wanted to release my top cydia app or tweak to date. This tweak allows you to assign any gesture (Pressing the home button twice, shaking the device, connecting or disconnecting power, slide motions, volume controls, and much more) to an action to be taken by the device. Personally while driving I want the ability to go to the next and previous track without interfacing with the screen because road safety is a big deal, as such, i set a long press on volume up to go to the next track and a long press on the volume down to go to the beginning of the song or previous track. This makes switching songs a painless act and can be done with one hand. You can come up with your very own associations so have fun exploring your options. As you can see from the figure on the left you can set where your customized action will be triggered (Anywhere, Home Screen, while inside an application, or lockscreen). When you select the activation level, you will be able to select the type of trigger (Double press, short press, single press, etc…) as the figure on the right displays. 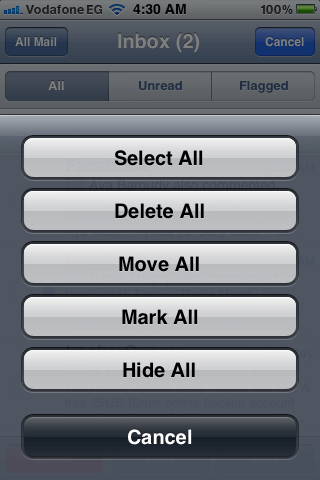 This is a very simple but effective Cydia tweak to add the functionality of applying the same action to all your email (Select, Delete, Move, Mark, Hide all) instead of scrolling through thousands of emails and selecting each one individually. 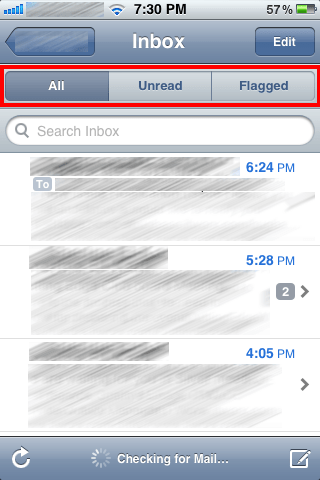 The mail app will be empty without this feature, a MUST have if you are a mail fanatic. Do you like to have a lot of Safari tabs open and be able to move between them seamlessly as well as close them in one shot? 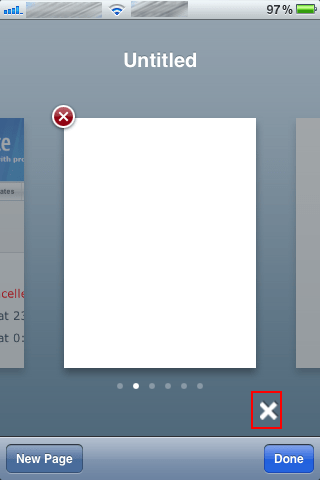 If so, then this is a must have tweak for you. This is a feature that should have been implemented in the stock IOS, with this tweak you will soon forget those dark ages. 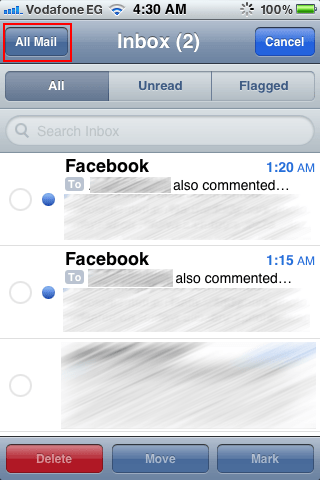 Another great feature is setting which email accounts are high or low priority and thus setting custom notifications for each. For example getting a different tone when a work email arrives as compared to a personal one. Last but not least filtering emails by three categories (All, Unread, Flagged), this can help if you have that one stubborn unread email but you can’t seem to find it after scrolling up and down. This is the first tweak i install on a freshly jailbroken device. 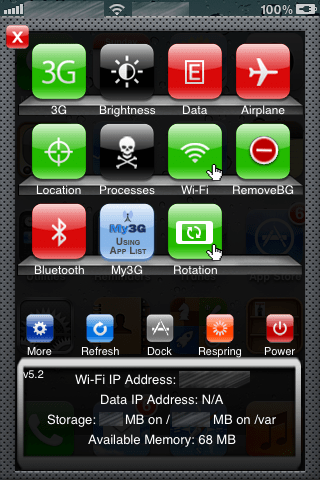 This app allow you to action like activating/deactivate 3G, Data, AutoCorrect, Bluetooth, rotation, and MUCH MUCH more. 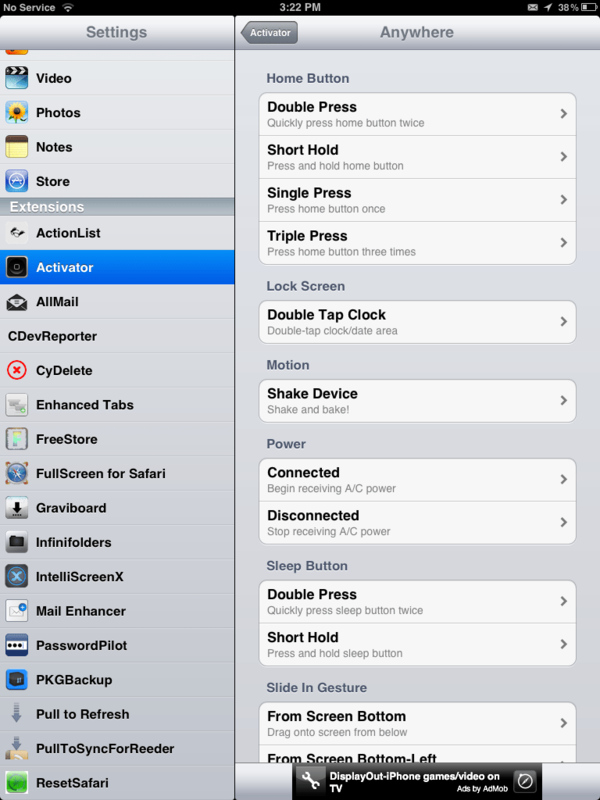 You can also reboot, respring, shut down the device all any screen you are at. This saves time from going knee deep in the settings app then search all around the levels just to reach a toggle button for the feature you want to activate/deactivate. If you are on an IOS version lower than IOS 5 then you can skip this tweak because it has been added to the stock IOS system. If you hate waiting beside your phone while it is synchronizing with ITunes dying to use it but know you can’t then this app will save you a lot of heart ache. 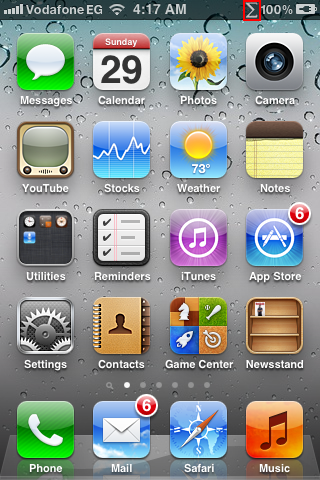 Instead of the full screen synchronizing you get while connected to iTunes, you will see a small icon on the top of the screen (See the figure below). Apple has this notion that you if you are on a 3G network then you be restricted from using certain apps that transfer a high amount of data. If you have a great 3G plan and don’t care about your usage then 3G Unrestrictor will trick your idevice to think it is on wi-fi network despite being on a 3G one. Examples are downloading an app that is larger than 20mb from the appstore or skype. 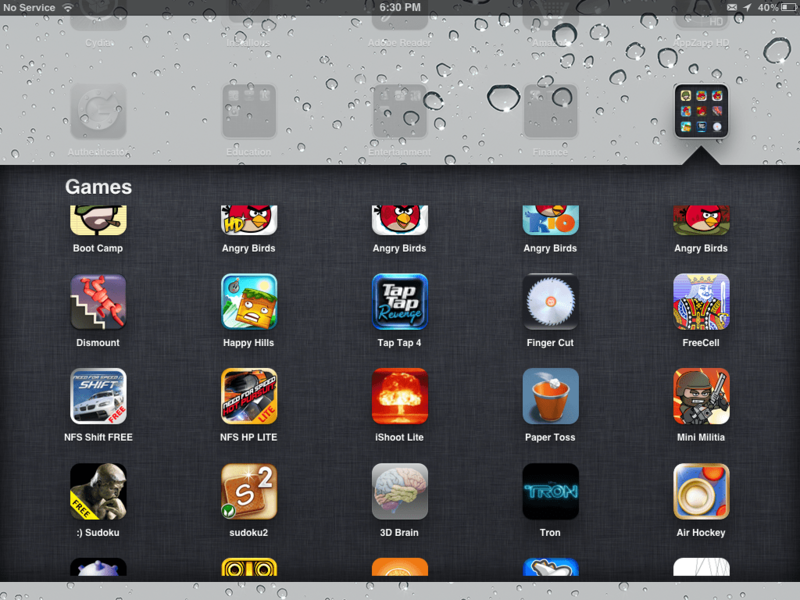 This entry was posted in Apple, Cydia, iPad, Jailbreak and tagged 10, apple, apps, cydia, ipad, iphone, jailbreak, top, tweak. Bookmark the permalink. I just purchased for me an iPad and an iphone 3gs, though i do not know how to mount apps and what sort of applications to get. Good thing i stumbled upon your guide, currently i have all the information and facts that i need. I just picked up for myself an iPad and an iPhone, however , i don’t know ways toinstall programs and what sort of apps to get. Great thingi foundyour content, currently i possess all the details that i need. Very great post. I just stumbled upon your blog and wished to say that I have really loved surfing around your blog posts. After all I will be subscribing to your rss feed and I am hoping you write again soon!